FREE or Discounted tickets to legendary Kalyra events including the Great Grape Stomp, and Kalyra's outdoor movie nights. Access to our Limited Production Lots (small productions from selected vineyards). Access to the special Very Merry 2-bottle Holiday Shipment, which includes only two special bottles at an increased discount... our Christmas present to you each year. 50% off up to a case of wine each year after your 2nd anniversary. WHAT'S A WINE THIEF? A wine thief is the name of the glass implement used to withdraw samples from a wine barrel. 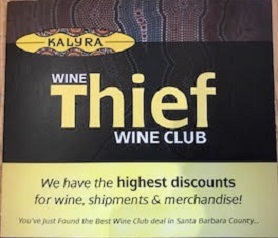 As a member of Kalyra's Wine Thieves, you will receive deeply discounted shipments of Kalyra's new release wines 4 times a year, starting as low as just $45/shipment! By purchasing this membership you are agreeing to be billed for 4-6 shipments a year of wine + tax + shipping charges. Billing is reoccuring until you have completed the four required shipments and then have let us know in writing via email to winethieves@kalyrawinery.com that you wish to discontinue the subscription. NO returns on wines. Must be 21+. Must be available to receive and sign for the wine. Returns and reshipping will incur additional costs. From Anonymous of Riverside, California on 2/18/2019 . I love saying I'm a Wine Thief almost as much as I love being one. The wine is amazing and the customer service is hands down the best in the valley.